I’m the Post-Doctoral Research Fellow in Cultural Heritage and Conflicts at the Norwegian Institute in Rome (DniR), as part of the Heritage Experience Initiative (HEI) of the University of Oslo (UiO). A range of material was presented and/or made available, such as economist Françoise Benhamou’s (French-language) presentation on the international art market in 2016: an appraisal (le marché de l’art international en 2016: un état des lieux); my presentation on the state of trafficking in cultural property in 2016; archaeologist Maria Luz Endere’s background paper on provenance for cultural objects: several difficulties and some lines of actions – the issue in Latin American countries; and ancient art dealer Vincent Geerling’s presentation on headline figures and misleading statistics relating to antiquities and the Syrian crisis (alternatively titled an old tradition preparing for transparency), on behalf of the International Association of Dealers in Ancient Art (IADAA). In addition, in preparation for the round table, I conducted a research study on illicit trafficking, provenance research and due diligence: the state of the art; UNESCO Wide Angle also published a summary article, which noted that archaeomafias traffic antiquities as well as drugs. Before and since the round table, I have analysed the “provenance” or collecting history of cultural goods on the market. However, I do not generally focus on the dealing-and-collecting end of the market. I did not highlight the research study when it was released, because an art market representative privately implied that I had misrepresented art market behaviour at the round table, by repeating the (as far as I know, still unretracted) advice of an art market consultant that Cambodia had ‘clear evidence’ that a statue had ‘definitely [been] stolen’ (which I learned from Chasing Aphrodite). They implied that I was ignorant of evidence that absolved the auction house of any suspicion of poor behaviour and queried the quantity and quality of research for the study. Accepting that I may have missed something, I queried whether the consultant had withdrawn their statement, but was simply told again that the settlement between the auction house and the plundered country had absolved the auction house of any suspicion of blame. It sounded so significant that I believed that I hadn’t read it and said so. Horrified by the possibility, I went away and checked, but found that I had read the relevant evidence after all. In the settlement, the United States did ‘not contend that Sotheby’s (or any of its lawyers, executives, officers, or employees) or Ms. Ruspoli knew or believed that the Statue was owned by the Kingdom of Cambodia or knowingly provided false or misleading provenance about the Statue’. Equally, Sotheby’s auction house and Ms. Ruspoli did not contend that the United States ‘did not have probable cause to seize, restrain, and/or forfeit the Statue’. In other words, they accepted that it did have probable cause. However, settlements are settlements, not forensic accounts. For a variety of pragmatic reasons, parties agree negotiated ends to legal claims. While I am not implying that a forensic account of auction house behaviour in relation to antiquities that have been looted from Cambodia would reach the same conclusion as a forensic account of Donald Trump’s behaviour in relation to people who studied at Trump University, Trump did pay $25,000,000 to settle a case in which ‘Trump and Trump University [did] not admit any wrongdoing‘. The respective legal settlements are of equal forensic value: nil. As I have noted since then, Christos Tsirogiannis continues to identify suspect and looted antiquities on the open market. As Tsirogiannis told National Geographic, the ‘fact that the auction houses continue to sell’ antiquities that are documented in convicted criminals’ archives ‘shows that they don’t really care to improve their behavior’; they ‘only care to continue to sell’. His continuing exposés are revealed through the Association for Research into Crimes against Art (ARCA), Looting Matters and Market of Mass Destruction. These exposés bring the discussion from the question of illicit trafficking, provenance research and due diligence to the question of confidence and risk, with which I concluded the research study. After UNESCO’s round table, I presented a paper on the importance of being diligent at ARCA’s conference, which opened with the image at the start of this post. 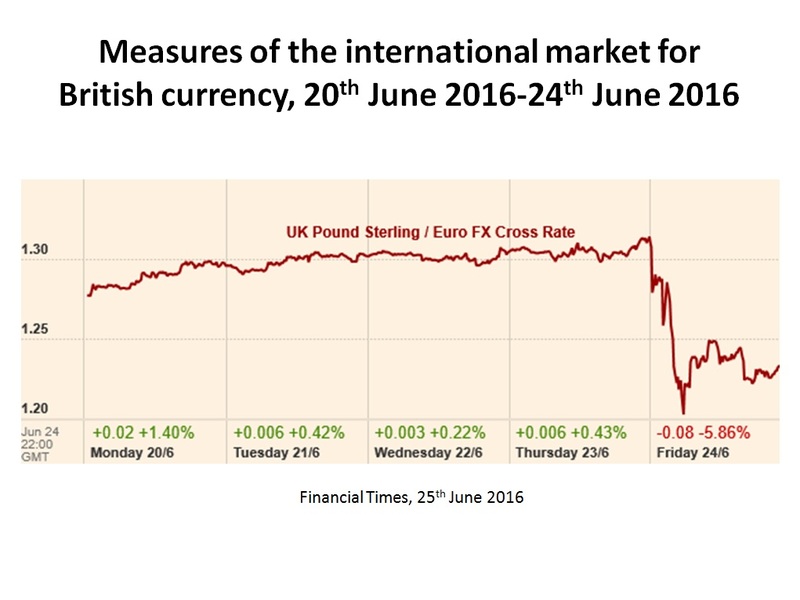 The top line tracks the international market for British currency over the course of the referendum for the United Kingdom to remain in or leave the European Union. It starkly demonstrates that when risk soars, confidence plummets (or, at least, confidence should plummet). 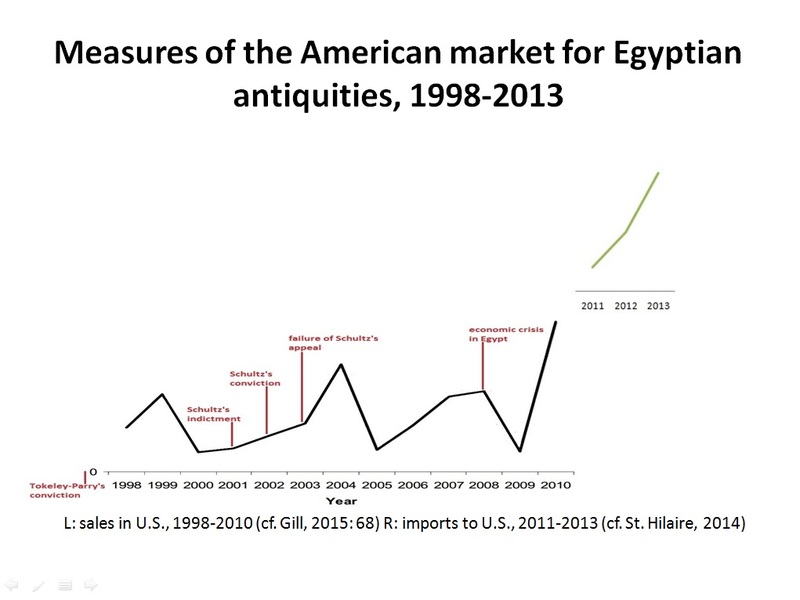 The bottom line tracks the American market for Egyptian antiquities (via David Gill and Rick St. Hilaire) over the course of a theoretical crisis for the antiquities market and a very real crisis for Egyptian society. It clearly demonstrates contrary trends. Although the international market does shrink periodically (and, then, only momentarily), it grows after Jonathan Tokeley-Parry’s conviction for dishonestly handling antiquities. It grows, at an increasing rate, through the years of Frederick Schultz’s headline-grabbing trial, his conviction for conspiring to handle stolen antiquities and his failed appeal. 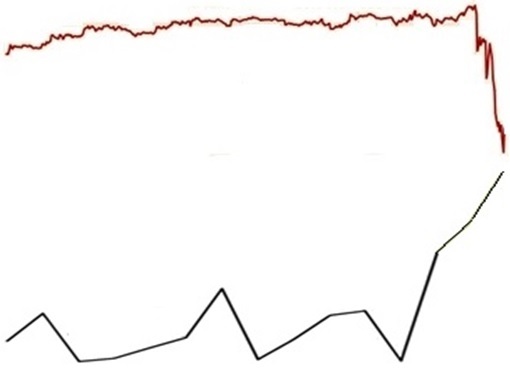 And, apart from a brief moment of shrinkage immediately after the outbreak of the global economic crisis, it grows through both the economic crisis around the world and the total crisis in “Arab Spring” and “post-Arab Spring” Egypt. The international market also grows despite the evidence of extensive looting in Egypt, insecure collecting histories for antiquities from Egypt on the international market and theoretically example-setting (or warning-giving) repatriations of antiquities on the international market to Egypt. Coinciding with Tsirogiannis’s perception, it appears that confidence in the antiquities market is not affected by (at least some kinds of) risk in the antiquities market. Particular markets may be liable to collapse if they are flooded with fakes, forgeries and/or counterfeits, because so many buyers vehemently reject such things; but those markets are not likely to collapse if they are flooded with loot, because so many buyers do not vehemently reject stolen goods, unless they are confronted with very serious risks. The avoidance of such risks can only be avoided through supply chain due diligence. Reblogged this on HARN Weblog.